We would like to Welcome You to Trail To Christ Cowboy Church, where our purpose is to reach the lost and unchurched people in the western culture with the gospel of Jesus Christ and provide a church home where they can become more like Him. We were started by a small group of folks in 2004 at the Cherokee County Show Barn. These folks had a desire to learn about and serve our Lord and Savior, Jesus Christ, and they wanted fundamental, truthful teachings of the Bible, not religion. Additionally, they embraced the western lifestyle and felt that others living that lifestyle would feel more comfortable in a "cowboy church". Today our dedication to these truths and our desire to serve Jesus Christ remains the same. Currently, our Sunday service runs about 200 people who are from all walks of life; working cowboys, arena cowboys, and just the cowboy at heart. 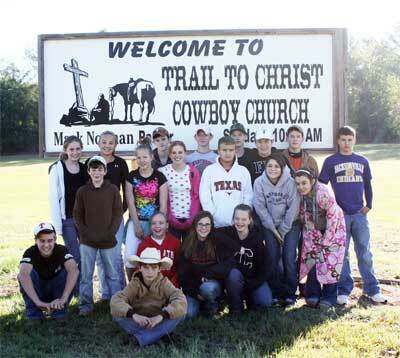 Trail to Christ Cowboy Church sits on 35 acres right off State Highway 79 just 4 miles west of Jacksonville, Texas. We also have a riding/event arena, and a children's "Tough Enough To Wear Pink" arena, where we hold Christ centered activities for all ages. Here's hoping you'll saddle up and come see us! You're always welcome, and the coffee is always on. Gotta B Jesus, because He is "King of the Cowboys". *Please click on flyer above to go to entry form & release form.